A Coverage Ratio is any one of a group of financial ratios used to measure a company’s ability to pay its financial obligationsDebt CapacityDebt capacity refers to the total amount of debt a business can incur and repay according to the terms of the debt agreement. A business takes on debt for several reasons, boosting production or marketing, expanding capacity, or acquiring new businesses. How do lenders assess how much capacity for debt a company has?. A higher ratio indicates a greater ability of the company to meet its financial obligations while a lower ratio indicates a lesser ability. Coverage ratios are commonly used by creditors and lendersTop Banks in the USAAccording to the US Federal Deposit Insurance Corporation, there were 6,799 FDIC-insured commercial banks in the USA as of February 2014. The country's central bank is the Federal Reserve Bank, which came into existence after the passage of the Federal Reserve Act in 1913 to determine the financial standing of a prospective borrower. 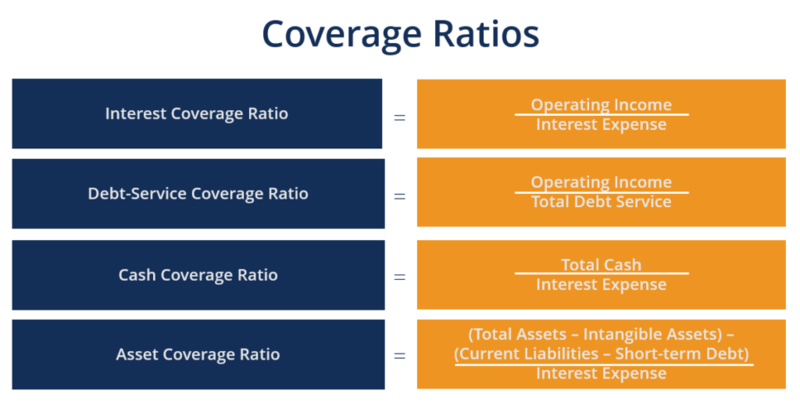 The interest coverage ratioInterest Coverage RatioInterest Coverage Ratio (ICR) is a financial ratio that is used to determine the ability of a company to pay the interest on its outstanding debt. The ICR is commonly used by lenders, creditors, and investors to determine the riskiness of lending capital to a company. The interest coverage ratio is also called “times (ICR), also called the “times interest earned”, evaluates the number of times a company is able to pay the interest expenses on its debt with its operating income. As a general benchmark, an interest coverage ratio of 1.5 is considered the minimum acceptable ratio. An ICR below 1.5 may signal default risk and the refusal of lenders to lend more money to the company. For example, a company reports an operating income of $500,000. The company is liable for interest payments of $60,000. Therefore, the company would be able to pay its interest payment 8.3x over with its operating income. The debt service coverage ratioDebt Service Coverage RatioDebt Service Coverage Ratio (DSCR) measures the ability of a company to use its operating income to repay all its debt obligations, including repayment of principal and interest on both short-term and long-term debt. DSCR is often used when a company has any borrowings on its balance sheet such as bonds, loans and line (DSCR) evaluates a company’s ability to use its operating income to repay its debt obligations including interest. The DSCR is often calculated when a company takes a loan from a bank, financial institution, or other loan provider. A DSCR of less than 1 suggests an inability to serve the company’s debt. For example, a DSCR of 0.9 means that there is only enough net operating income to cover 90% of annual debt and interest payments. As a general rule of thumb, an ideal debt service coverage ratio is 2 or higher. Therefore, the company would be able to cover its debt service 2x over with its operating income. This is one more additional ratio, known as the cash coverage ratio, which is used to compare the company’s cash balance to its annual interest expense. This is a very conservative metric, as it compares only cash on hand (no other assets) to the interest expense the company has relative to its debt. This means the company can cover its interest expense for twenty years. Since the cash balance is greater than the total debt balance the company can also repay all the principal it owes with the cash on hand. The asset coverage ratio (ACR) evaluates a company’s ability to repay its debt obligations by selling its assets. In other words, this ratio assesses a company’s ability to pay debt obligations with assets after satisfying liabilities. The acceptable level of asset coverage depends on the industry. An ASR of 1 means that the company would just be able to pay off all its debts by selling all its assets. An ASR above 1 means that the company would be able to pay off all debts without selling all its assets. Therefore, the company would be able to pay off all of its debts without selling all of its assets.